Both the Colombian government and the Revolutionary Armed Forces of Colombia (FARC) are preparing for their meeting in the Norwegian Capital, Oslo, on October 17. The FARC delegation is composed of five plenipotentiary members and five deputies led by Ivan Marquez, the second in the FARC commanding hierarchy after Timochenko, who occupies the top post. Marquez was a member of the Communist Party before joining the FARC in 1977. In 1980, he became a representative in Congress, but due to right wing death squad extermination campaigns against the left, he went back to the guerrilla ranks. Marquez, a lawyer by profession, participated in all previous negotiations with the state and may be the most experienced in the FARC. He was born in Caqueta to a lower middle class family. The other plenipotentiary member is Simon Trinidad, who is currently serving a 60-year prison sentence in the United States. He is accused of the kidnapping of three CIA contractors rescued in 2008 by a joint Colombia-U.S. operation. Trinidad is the son of a prominent middle class landowning family from Valledupar in the department of Cesar. Like many members in the FARC leadership, his political participation began in the Communist Party. Prior to joining the FARC, he worked as a bank executive after earning a graduate degree in economics from Harvard. Rodrigo Granda, Marco Leon Calarca, and Andres Paris are the FARC’s ambassadors of sorts. There is not much information about their social backgrounds. In political terms, I disagree with those who divide the FARC’s negotiating team in terms of hard-line, political, and soft-liners. The FARC is an armed political party, unified by a common political experience, and the decision to find a negotiated settlement was reached even before the FARC founder and leader Manuel Marulanda died in 2008. This explains the eagerness of Marulanda’s successor, Alfonso Cano, to initiate contacts with the Santos government since he assumed his commanding post. Cano's peace overtures were in effect until his killing by the Colombian special forces in 2011, an incident which was confirmed by Santos himself. In the wake of Cano's killing, I wrote a blog in which I questioned Juan Manuel Santos’s intentions, asking whether he intended to kill the messenger, the message of peace, or both. Cano’s falling did not alter the FARC peace-seeking settlement. It was followed by FARC’s release of all its prisoners culminating in its renouncement of “economic retention,” or kidnapping, in early 2012. These acts validate the proposition that an internal consensus has in effect emerged within the Secretariat to explore a peaceful exit while the FARC adjusts its military structures to absorb the state's military offensive. One more important factor surfaced that helped in the rapprochement between Santos and the FARC at this juncture: the crucial role of Hugo Chavez and the notable improvement in the bilateral relationship between Colombia and Venezuela since Santos assumed power in 2010. Chavez not only cooperated with Santos on a number of issues such as the extradition to Colombia of Joaquin Perez, the director of the news agency Anncol, who is an accused FARC member. 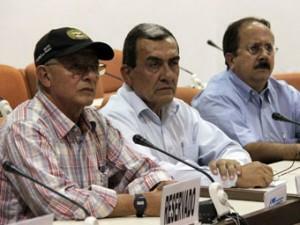 The administration also aided in the capture of other members of the FARC acting in Venezuela. While this did not please the FARC, this helped to create a better relationship with Santos, while not completely cutting ties to the revolutionary movement. Furthermore, Venezuela was instrumental in the capture of narcotraffickers, which recently netted “El Loco Barrera,” one of the most notorious narcotrafficking figures in the region. Together these Venezuelan gestures were set against the backdrop of an increasing trade relationship between the two countries that has resulted in an increased economic interdependence. The improved relationship with Colombia better positioned the Chavez government to play the role of an honest broker between the FARC and the Santos government. In this context we can better appreciate the historical significance of the surfacing news reports about the meeting between the FARC's maximum leader Timochenko and Chavez shortly before the commencement of the Cuba exploratory peace talks between FARC and Santos government in February 2012. Clearly Chavez persuaded the FARC to embark on a peace process in which Cuba will act as a facilitator and Venezuela as an observer. The composition of the facilitators and observers reflect a balancing act between the Santos government and the FARC. Chile’s right wing government provides assurance to the Santos administration, while Cuba puts the FARC at ease. Venezuela and Norway play the role of mid-field referees. We know from conflict studies that the role of third parties in conflict resolution is at best problematic, because it often does not produce the desirable outcome. This may stem from multiple causes, including whether the initiative for peace came from the actors’ themselves, convinced that their conflict has reached the tipping point, or whether third parties imposed their intentions and desires on the warring parties. In this case, I believe that the economic and military costs of this conflict have reached the point of diminishing political-military returns. Both parties (state and guerrillas) are realizing the exorbitant costs and wondering whether this war system can be sustained. The current unstable equilibrium of the war system, which replaced the comfortable impasse that governed the conflict for several decades, has now led to what William Zartman has called a “mutually hurting” balance. Under such a condition, the role of third parties becomes more fruitful as the international experiences demonstrate. Cases in point are Guatemala, El Salvador, Lebanon, Zimbabwe, Mozambique, and Nepal, where third parties helped in reaching an agreement. I hope that the coming months will not prove me wrong.